While I was coding the site, I noticed the amount of green and it looked odd because of how solid green it was. I mean, the shadows and whatnot where it shows some grass are great but I think it needs to be a bit more detailed. Here's a few of them I found (my friend created the first one on the bottom), and yes, the very first one is from Fantasy Online #rip . Edit: Just noticed the Background art topic about this, but whatevz. I like the top left and bottom right one the best. I think variations of those would fit best. The other two styles are a bit noisy imo. Mimies what do you think? @Hydracol I like the texture of the bottom right one. 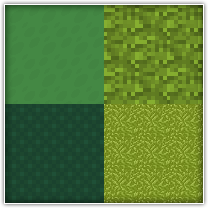 The bottom left looks a bit like linoleum... However, the top left will be the easiest to implement and I think something like that would go with the cutesy scenery. Everything in the game is relatively flat (not speaking of perspective, but of how...2D? it is); if we add something too 3D, it will seem a bit out of place. But there's no reason we can't find a happy medium. Lol doesn't sound very decisive but I suppose we'll have to make a few versions of our own before we can really know. I definitely agree. Play around with it and see what you come up with! Wasn't even thinking of that, haha!